Documentaries about famous bands are not new. They offer a chance for fans to take a closer look at the artists they love, and the best ones provide illumination on what drives artists, the demons they face, and the attitudes and emotions that can tie a band together or ultimately break them apart. When Morgan Spurlock decided to shoot a documentary focusing on world famous boy band One Direction, he may have had the intention of capturing something great or moving, but he has instead produced an 84 minute commercial for the band’s upcoming tour. The documentary begins as the boys making up the band, Niall Horan, Zayn Malik, Liam Payne, Harry Styles, and Louis Tomlinson, are preparing for their next world tour and it quickly moves to look at the bands beginning. To sum up, One Direction is wholly the creation of Simon Cowell and a British reality talent show. Their’s was not a magical moment where talent and drive to express themselves haphazardly met. They were produced for profit. Once on the road, the movie cuts between filmed concert performances, the hijinks of the band on the road, their families reaction to their fame, and the increasingly keyed up crowds of girls who surround the band at hotels, concert venues, and in cars. In one scene the band is walking down a busy and popular shopping street in a European city, when they are mobbed by girls and stuck in a Nike store until they can get more security. This shopping trip scene is just one example of how forced and contrived this documentary is. Instead of existing with the band and getting to a level of comfort where they no longer think of the cameras and just start being who they are, it was more like Spurlock and the band’s agents created a storyboard of all of the things that need to be seen in a documentary about an upstart band struggling with fame. Childhood challenges – check. Parents crying about how they knew them when and how much they miss them – check. Band member gets to buy his family something they never could have afforded before – check. Band members talk about struggling with their own fame – check. At no point in this documentary is there a feeling of actual spontaneity, connection, or insight. The closest thing to actual interesting material are the shots of the girls that flock to this band and how social media helped make them as big as they are. The crowds are expansive, and it is hard not to be amazed that so many people care enough to camp outside any place they may be for hours on end just to catch one glimpse or possibly actually see them face-to-face. The explanation of how the band’s popularity spread among young girls worldwide is interesting, if not a bit cheesy in the discussion with scientists. It is hysteria that cannot be faked, but even this is not enough to make the overall documentary worthwhile. As with the shopping trip mentioned above, even some of this hysteria seems written in. A more interesting documentary might have dug in with the crowds of girls to understand the fans more. On top of the disingenuous approach, the move includes an entire 3D section that is completely unnecessary. During one concert scene, we see illustrated Atari-era spaceships, lasers, and shooting stars zoom around the screen. Something you might see in a music video, but not really something you’d expect out of a serious documentary. Ultimately, the 3D effects are merely additions that allow the studio to charge more money for tickets. All of this might be forgiven if it was anyone else directing the film. It’s promotional material – so many could do this project, but Morgan Spurlock has done better and the viewer cannot help but remember that. This is so different than his normal work it is surreal he is a part of this. Perhaps Spurlock has a gigantic project in mind and needs the cash – I hope so because that is what might redeem his direction of a rockumentary about a band that does not really rock and comes off as shallow as their music. After the scripted situations and cheesy 3D, the documentary ends with the band “camping” in a Swedish forest. As they sit around the fire having the existential conversation of whether or not they can be more than a boy band, at least one band member has the integrity to say the best they can probably hope for is to be THE boy band of this era. He is likely correct, and I do not fault these young men for making the most out of this fleeting opportunity. However, devoting resources and the talent of someone like Spurlock to this project is unfortunate. Anyway, I hope the screaming ‘tweens enjoy it so they can cringe/laugh about it later in life. I had the pleasure to sit down with Morgan Spurlock and talk about the film. Watch my interview below. 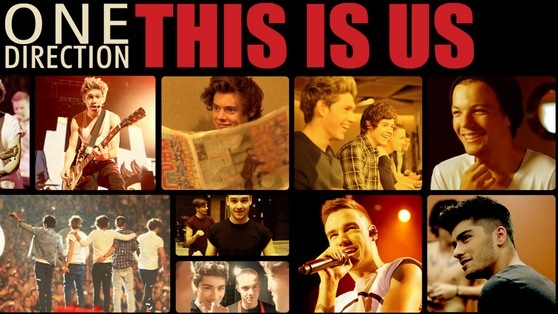 Film Review: ‘One Direction: This Is Us’!! This entry was posted on Friday, August 30th, 2013 at 8:39 am	and is filed under Film, Music, News. You can follow any responses to this entry through the RSS 2.0 feed. You can skip to the end and leave a response. Pinging is currently not allowed. « James Spader Cast as Ultron in ‘Avengers’ Sequel!! !